Long ago, we started promising our guests one thing. We don’t promise that we’ll make it to our intended destination. We don’t promise that a trip with us will be easy. We definitely don’t promise that all will go according to plan. But we always make good on our one promise: no boring stories. We left La Cruz around mid-day and drove a couple of hours to Las Tres Marietas, a group of protected islands near the entrance to Bahia de Banderas. We navigated carefully, aware of the many uncharted, unmarked rocks and reefs in the area. I breathed a big sigh of relief when we found a safe place to drop the hook a few hundred feet off the large middle island. After a failed attempt to land the dinghy on the beach for snorkeling (the rocks and swell made it more exciting than even The Crazy Grandmas were up for), Meira, Hannah, and Michele snorkeled around the boat for a few hours. Again, the visibility wasn’t great, but they had a great time. Just before sunset, a 48-foot sailboat pulled into the cove and picked up one of the orange buoys. Bryan rowed over to say “Hi” and discovered that the buoys are available for use as part of the National Park system. We had planned to move before dark to the anchorage at nearby Punta de Mita, but decided to drop a stern anchor out (to keep us from swinging into the other boat) and just spend the night. A few minutes later, a huge, 80 foot, 4-story power boat came into the anchorage. Some of the boat’s crew motored ahead in a panga and attached lines to the 2 remaining mooring buoys in the bay. We were just resigning ourselves to their presence in our peaceful, sunset view when they cranked up the loudspeakers. Michele, just getting ready to take a fresh-water rinse from our solar shower on the cabin-top, joked, “I could just start taking my clothes off. That would clear the cove for you.” She had no sooner started her shower—fully-clothed still—when the power boat dropped their mooring lines and motored off. We sat in the cockpit through the whole gorgeous sunset until the stars brightened in the indigo sky. Down in the water, spots of bright green phosphorescent glitter collected into swirling spirals and then winked out. Solitary blue sparks floated by unheeding. No one could find the energy to go below and cook dinner, we just sat and soaked in the beauty. By the time we went to bed, the calm evening had turned into a rolly night. We had anchored to hold our bow to the prevailing north wind and swell, but in the night, the east wind picked up on our beam and by 2 am or so it was knocking us around so badly, we decided we’d be better off heading out to sea and getting an early start on our planned trip up to Chacala. If we were swinging to just one anchor, the wind would have blown us into a more comfortable position. But now we were stuck; we couldn’t just loose our stern anchor or we’d swing into the neighbor boat. Trina was getting increasingly seasick and Michele had given up on putting stuff back on the settee shelf and just decided to sleep with whatever fell on her. She ended up cuddling with a spindle of DVDs the rest of the night. For the first time in a long time, Bryan and I dug out our jackets. We stood around in the breezy cockpit coming up with a plan. We decided to attached a buoy to the end of the stern anchor line, pull in the bow anchor, and then motor around to pick up the stern anchor. About the time we were ready to start, we heard the unmistakable—and very near—sound of whale breath. The last thing I wanted was to worry about a tangle with a whale in the middle of our middle-of-the-night maneuvers, so I was very glad when they just moved on by. We got the stern anchor buoyed and the bow anchor up without any trouble. But when we came back around for the stern anchor, it wouldn’t come up. We’d snagged on something, a rock or some debris on the the bottom and now we were stuck again, this time with our stern anchor hooked over our bow. We took a few minutes to think. We weren’t going anywhere, after all. Most boat crises are slow-motion emergencies (the day we caught fire and the day we thought we’d sprung a leak, notable exceptions.) By this point, our stern had swung around close to one of the 3 mooring buoys in the cove. We didn’t know if we could trust our fouled anchor to hold all night, and we didn’t know how secure the mooring buoys were. Rocky cliffs loomed nearby and we didn’t want to wake up finding both anchor and buoy had let go in the night. So we tied a stern line to the buoy and took turns keeping an anchor watch until dawn. Meira woke up in the hullaballoo and while I took the first watch, she and I mentally searched the boat for something to use as a kellet. OK, I know there are a few of you who would be really cranky with me if I didn’t tell you what we did to free the anchor. The rest of you, feel free to skip this explanatory paragraph. An anchor often gets stuck when its flukes or its plow (they’re different types of anchors, but either way—the part that digs into the seafloor) gets caught on something. Because the rode is attached at the back end of the anchor shank, pulling it up the normal way also hauls back on the anchor, pulling the flukes on the front even more firmly against the obstruction. Picture it so far? If you know you’re going to anchor in a particularly foul area, you can hook a second line to the forward end of the shank (the end nearest the flukes, etc) and buoy the upper end of that line with a fender or empty milk jug. Then if you have trouble getting the anchor to come up the regular way, you can haul in that extra line—the tripline—to pull the anchor out backwards. OK, now comes the tricky part. Say your anchor is fouled in an area you didn’t think was bad. So you didn’t put a tripline on when you set it. And its too deep to dive and attach one now. All is not lost. It’s possible to add a tripline to a set anchor. You can attach the tripline to a kellet (just a round weight), slip the kellet over the bitter end of the anchor line (the end you usually keep firmly attached to the boat), hope the weight carries the line down the anchor rode and smoothly down the shank to the forward end. It’s a precarious sort of tripline, but it’s better than nothing. So Meira and I stayed up for a while brainstorming what we could turn into a round weight. In the morning, we put our idea into action. I wound our stainless dinghy-lock cable into a tight circle and held it while a tired Bryan duct-taped it into shape. We attached a line to our MacGyvered kellet and sent it down. Bryan dropped the dinghy and tried pulling up the tripline from the dinghy but he couldn’t get enough leverage that way. He came back onboard, loosed the stern line from the mooring buoy, and I drove slowly forward while he tried pulling up the tripline from the bow. Next I knew, our anchor was free, but we were drifting backwards past the mooring we’d just released, heading for the cliffs. We drifted on one side of the mooring and Rover drifted down the other side. A bit of hasty hollering and a scramble or two later, we were clear, anchor all the way up, heading out to safer water. Bryan still needed to pull the dinghy up for our long day at sea, but the chop in the bay made it difficult. He almost had it up on the bow when a wave splashed into the dinghy and filled it to the brim. Bryan dropped it back over the side (thankfully, the dinghy painter was still tied to LiLo) and yelled, “Floatation check!” While I drove slowly into the swell, he hopped into the dinghy with a bailing bucket. Even full to the gunwales with water, the dinghy floated him just fine. When Rover was mostly empty, Meira went up on the bow to help and the 2 of them wrestled it up onto the cabin top. After the night we’d had, with hardly any sleep, and the morning of work, a day of travel was the last thing we wanted. But the ocean was calm and the sun was out. Before long, we were glad to be there. And that was even before the whales came out to play. A pod of 4 or 5 whales kept pace with us, a few hundred feet off our port side, for more than an hour. 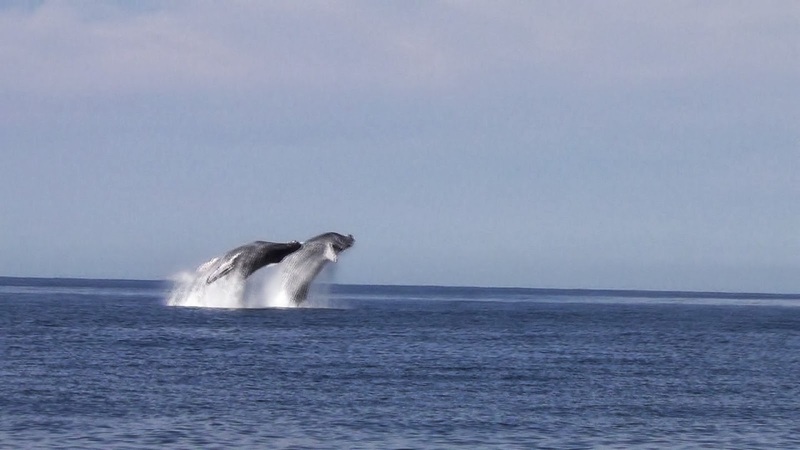 It’s hard to express how active they were, spouting, jumping, surfacing, diving. But Meira kept track of tail sightings—just the tails, not the flipper-slaps, the dorsal fins, or the breaches. She figured that if she saw one whale tail a year, it would take her until she was 80 to see as many as she saw in that hour alone. We pulled out cameras to capture the action, trying not to focus so much on the pictures we didn’t enjoy the moment. Suddenly, 2 whales breached in unison, their powerful bodies slipping into the air, free, just for a moment, of the weight of the sea. They flew, hung, succumbed to gravity. The sound came just after the splash, the biggest belly flop ever. The pod swam straight, parallel to our course at a comfortable distance. At one point, though, they turned and headed our way just as we noticed a whale off to starboard. We slowed down to let them sort out who was going where and breathed a little easier when the pod moved on out to sea. Our neighbor hopped in his dinghy, came by to grab our stern anchor and an assistant (Meira was happy to hop in and help out), and rowed our stern anchor out. He pulled our boat straight back from our bow anchor and dropped the stern anchor with a splash. We set the stern anchor with the winch, as planned, got Meira back on board, and Bryan immediately dove over to take a look at our propeller. We were afraid we might have chafed our anchor rode or tangled the line so badly we would need to cut it loose. But 8 or 10 dives later, Bryan announced, “We’re free!” A few minutes later, we were set for the night. We dropped the dinghy and rowed to shore for a well-deserved celebration meal. The restaurant owner’s small daughter immediately dragged our girls off to the play corner and we all had a lovely evening. Later in our stay in Chacala, the dinghy cable we’d used as a weight was stolen from the beach. And something chafed through the rode on our stern anchor (the one we’d worked so hard to recover!) and it broke free, setting us swinging through the tight anchorage on just our bow anchor. Thankfully, we had just come aboard at the time, so Bryan quickly dug through the stern lazarette for the 35 lb storm anchor we’d been given in Mazatlan. Unnerved by the maneuvers in the dark, I kept an eye on our proximity to the other boats while he rowed us back into position and dropped our big anchor. From their room overlooking the bay, Trina and Michele spotted the erratic movement of our anchor light and in the morning, we had some explaining to do. We’d promised…no boring stories.